As soon as I saw this recipe I knew that’s what my bananas were destined for. 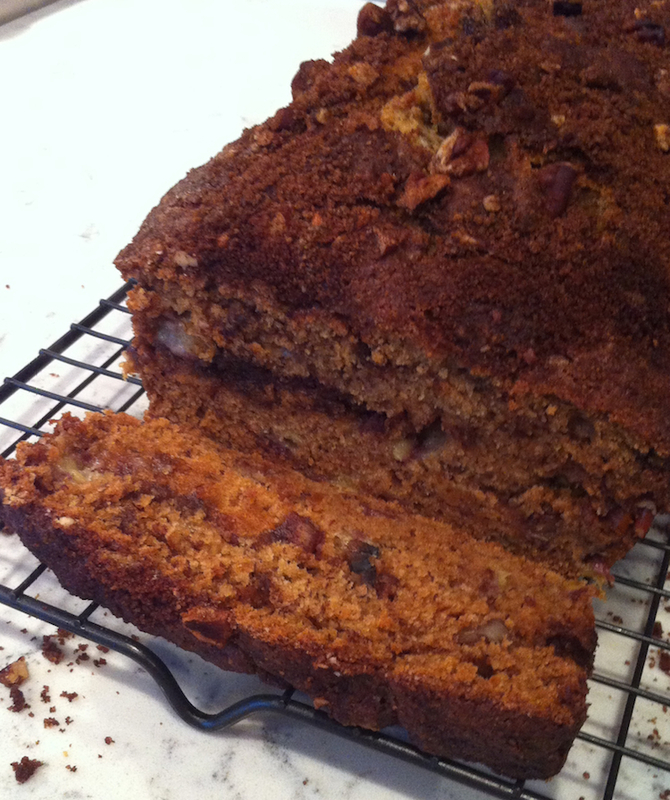 And then, with 3 nicely blackened bananas on my counter, I read the recipe…and realized I only needed 1 banana. So this recipe is heavily adapted so I could use my 3 bananas. It turned out as deliciously as I’d hoped. Do you ever get excited about a recipe and forget to make sure you actually have all the ingredients? This used to happen to me a lot in high school! So often that one of my best friends kept threatening to get me a chicken so that I’d always have eggs on hand. Preheat oven to 350°F. Grease a 9×5″ loaf pan with cooking spray and set aside. Sift together the flour, coffee, baking soda, and salt. In a separate bowl, cream the butter and sugar together until light and fluffy. Add eggs one at a time, beating well after each addition. Add in bananas and vanilla. Add dry ingredients to the wet, mixing until just combined. Scoop 1/3 of batter into prepared loaf pan. Sprinkle with 1/3 of the swirl mixture. Repeat twice more, so that the last of the swirl mixture tops the last third of the batter. I am not normally a ‘bread’ guy but this bread is incredible. It may have taken the owl three licks to get to the center of a Tootsie Pop but it only took one bite for me to get hooked on this delectable recipe.